We need a like button. I liked Mead’s comment of “… all I got was this lousy insurance requirement”. We shouldn’t forget that ObamaCare was written in the dead of night by Harry Reid’s office, voted on, unread, by the Senate hours later and sent to the House which passed it “as is” so it would not have to go back to the Senate where Scott Brown’s vote would have killed it. Therefore, there was no internal consistency check. There was no opportunity for clarifying amendments. There was no opportunity for anything Harry Reid did not think was appropriate. That is why we keep finding these unintended consequences that Obama tries to paper over with Executive Orders. That is why the idea of “fixing” ObamaCare is a very bad idea. There are so many traps in the bill (as well as in the stacks of “rules”) that no one could untangle the mess. This is just like a badly designed web site. Best to start all over than try to add undocumented patch upon undocumented patch in a vain attempt to fix it. If the Republicans get control of the Senate, they should identify what the minimum requirements of a health care system should be, and create a much simpler, easy to understand bill and send that to Obama. As a fan of the KISS principle I agree with his fix for our health care system although I am very skeptical that the right political environment will exist in 2015 or 2016. The unsubsidized health insurance price increase for healthy people is a problem that is just not going to get solved without major changes to the Affordable Care Act. It is a sign of insanity when Affordable Care Act supporters chase away the best customers and expect our health care system will become sustainable. For kicks I went over to the Kaiser Health Subsidy Calculator again and here is what I found. I am paying $407 per month for a silverish-bronze unsubsidized, grandfathered plan with a $3,000 deductible. For the mathematically challenged that is $4,884 a year. So why does a $12,627 plan with a $6,927 subsidy make sense for a healthy person or the country? The country would be paying $6,927 more for something they got for free in 2013. I would be paying $816 more for a silver plan. 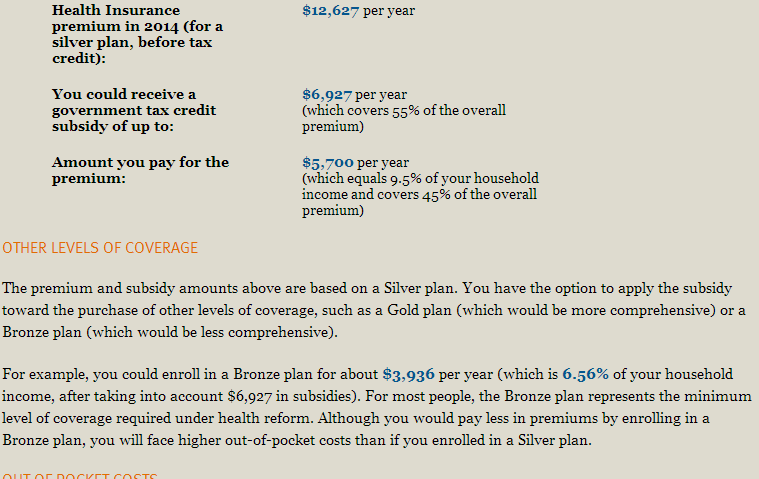 The silver plans I looked at had a higher deductible, too. The winners in this environment are those folks who think the biggest problems facing health care reform will be fixed by throwing more money at it. I remain skeptical that this shell game approach to health care reform will fix anything. This leads me to the conclusion that repeated delays is the simple, popular, and successful political answer to fixing the Affordable Care Act.